Enter your e-mail adress to get the latest news and ideas! Comprehensive, detailed, and easy to read and understand, How to Succeed with Continuous Improvement takes you through a real-life case study of one organization’s journey to a world-class continuous improvement process. Joakim Ahlström—one of the world’s most respected continuous improvement experts—serves as your coach. He first helps you decide whether you want to embark on the continuous improvement journey and takes you through the entire process step by step, all the way through generating remarkable business results with his unique methods. Ahlstrom explains rational behind all the methods in the book—the results they produce, and why—and offers practical advice on how to get full input from everyone involved. Ahlstrom concludes the book with a chapter offering a current-state analysis tool and a simple template to apply in your company. 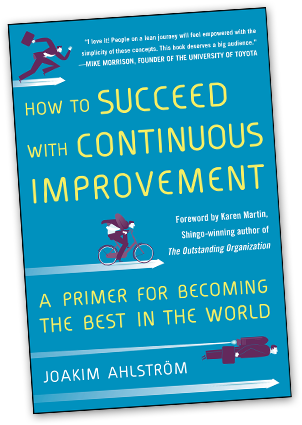 If you’re seeking to design and launch a continuous improvement program, How to Succeed with Continuous Improvement is the first book you should turn to—and it’s the last one you’ll ever need!